Working on new shop interface…. 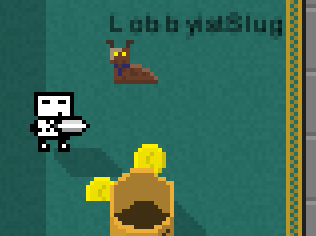 Ok, server back up, with extra error handling and some debug info that may help me figure out the intermittant slug spawning issue. Yeah, I just broke the server…. The latest build adds two things. First, there's a new mob which doesn't attack you but only gives you limited gold. It currently only exists in the newbie area, but I'm considering having it spawn in the wilderness too. This should hopefully make it easier for new players, so they don't have to worry about learning to defend themselves right away. 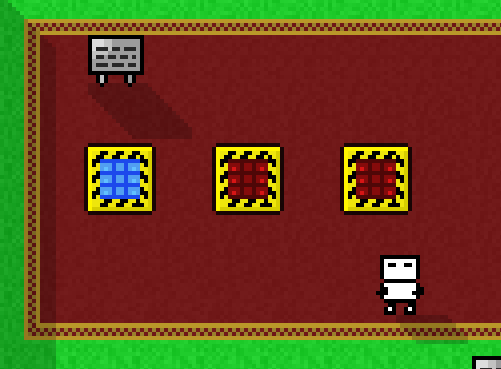 I have just finished creating Teleporters, a frequently requested object. They are live on the server right now, can now be built by anyone! Just stand on top of a blue one and press 'E' -- you'll be instantly teleported to its linked teleporter. Red teleporters have not yet been linked. Buy two from the shop. Place them each at the two locations you'd like them to be. The telepads are now linked, and anyone can press E to transit between them.